Continuing with the swatches of the entire Maybelline Fit Me Range launched in India, we have the pressed powder or the compacts this time. I have already swatched the Maybelline Fit Me Foundations and shall be reviewing it soon. The Fit Me Range seems to be a hit and miss and sadly for me the Maybelline Fit Me Powders fall in the latter category. The Maybelline Fit Me Pressed Powders are packaged in a nice square casing with a double lid. The top casing contains the compact and the puff is housed in the bottom casing. The packaging feels and looks good and is travel friendly. Unlike most compacts this is aimed at normal to dry skin. The new Maybelline compacts are available in 5 shades in India and below are the swatches. Maybelline Fit Me Pressed Powder 120 Classic Ivory Swatch: The palest shade in the range, this almost looks like chalk on my NC 30 (for reference) skintone. Maybelline Fit Me Pressed Powder 130 Buff Beige Swatch: This is a more pink toned powder but still a bit pale for my skintone, an issue I faced with all the shades. Recommended only for very fair or pale girls. Maybelline Fit Me Pressed Powder 310 Sun Beige Swatch: The darkest shade in the range yet something that would only suit fair girls. This is a warm toned beige which was a close match for my skintone. 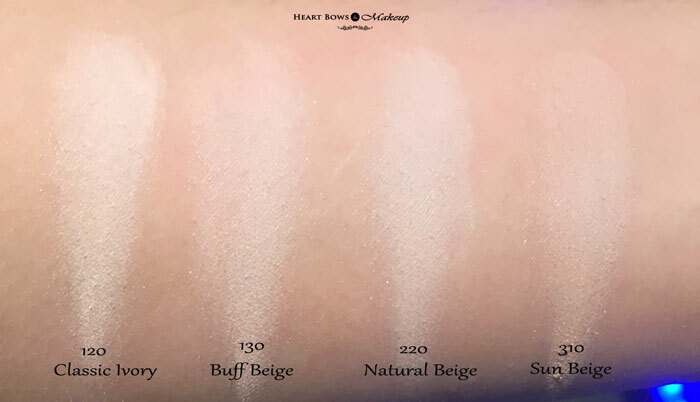 There is probably another shade 230 Natural Buff available in the range however the store did not have it. 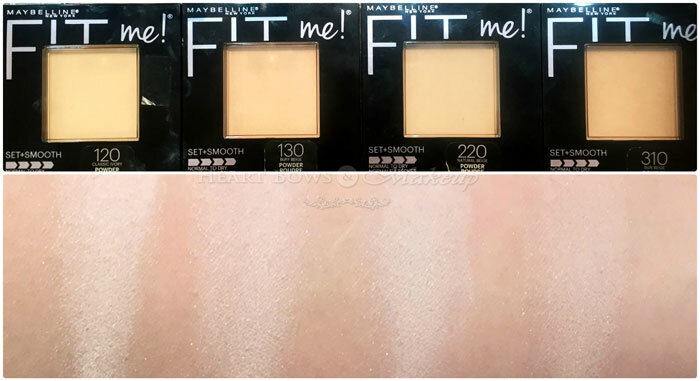 I was highly disappointed with the Maybelline Fit Me Powder’s shade range and I faced a similar issue with the Maybelline Fit Me Concealers. Unless you’re super pale, which is rare in India, you’re unlikely to find a match. The powders look alot more warm and darker in the pans but are much lighter upon swatching. It has a finely milled texture and I’m still testing it out. But based on the shade selection alone and considering the higher price tag compared to their other compacts I wouldn’t recommend it.